ANSWER; My names are Eddy Noma a Nigerian upcoming Artist based in Italy. QUESTION; YOU SAID IT TOOK YOU 30 MONTHS SEARCH TO FIND YOUR FATHER HOW COME? ANSWER; My Mother was pregnant of me and I was given birth to in Europe ever since I became a Teenager I have always desired to search for my DAD. I had made some efforts that failed until I met the President of the Nigerian Community in Rome Chief George Owere who helped me to do the final link. QUESTION; WHO IS YOUR FATHER AND WHAT REALLY HAPPENED? ANSWER; My Father is Orits Williki and I am very sorry I may not be able to tell you about all that happened because I was in my Mother's womb then but ever since I linked up with him he's been of lots of blessings and inspirations to me hitherto, people use to tell me of how big he is in Nigeria as a musician and that use to give me some excitements and inspirations because I have always known I was going to be a musician ; so when I eventually and initially opened links with him, he was of the strict opinion that I finish my Education first before anything else and he promised to give his full support when that time comes. So as soon as I graduated I said Nigeria here I come and true to his promise he hasn't disappointed me he actually produced me with support from some other young Producers in his beautiful Studio. QUESTION; WHAT HAS MEETING HIM MET TO YOU? ANSWER; Meeting him finally has been of great blessings to me in fact little was I told of how great he really is. He is a very humane, loving and intelligent personality, very committed, kind and also very humorous but very disciplined. I love these qualities so I am very proud of Him. ANSWER; I play what I can call AFRO HIPLIFE POP because my music is a blend of AFRO BEAT HIGHLIFE AND HIP POP but well put together with special emphasis on live instrumentations so my music is not the usual preset beat from Fruity loops or software presets sounds; we create our sounds. QUESTION; WHEN ARE WE EXPECTING THIS RELEASE? ANSWER; As a matter of fact in few weeks. We are about hitting locations now for the video shoot. 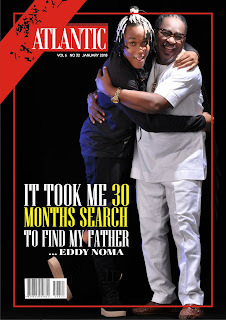 0 Response to "''It took me 30 months search to find my father'' - Orits Wiliki's lost son, Eddy Noma says"